In Apple’s iOS 11 update, the Control Center is completely overhauled. More controls are available, which saves you the hassle of digging into apps and settings. Control Center is always accessible with a quick swipe up from the bottom of your screen. For example, you can set a new alarm or timer from Control Center, instead of having to open the Clock app. You can turn Low Power Mode on or off, instead of digging into Settings > Battery. It’s even got some brand-new skills, like controlling your Apple TV, recording your iPhone or iPad’s screen, and keeping you from being distracted by notifications while you're driving your car. Best of all, iOS 11 lets you customize Control Center for the first time ever. You get to select which buttons will show up, and rearrange their order. What Exactly is Control Center? Control Center first appeared as part of iOS 7, although it’s much improved and expanded in iOS 11. Control Center is designed as a one-stop shop for doing quick tasks like turning Bluetooth or Wi-Fi on and off, adjusting the volume, or enabling the screen-rotation lock. In fact, when the iPad Air 2 lost its side switch (which could be used as a mute button or to lock the orientation in portrait or landscape), the justification was that you could do either of these things in Control Center, no matter where you were in iOS. Control Center appears when you swipe up quickly from the bottom of the screen on an iPhone or an iPad. In iOS 10 and earlier versions, Control Center had two or more panes, and you could swipe left and right between them. The first pane had system controls like brightness, Bluetooth, Wi-Fi, Airplane mode, and so on, while the second pane held music controls (volume, play/pause, AirPlay), and a third panel appeared if you had HomeKit devices set up, with a button to control each device. In iOS 11, Control Center is redesigned to keep everything on one screen. You won’t have to swipe back and forth between panes, but you will find yourself tapping some Control Center items to expand them to full menus. Tap the Control Center item in the main list. Here you’ll find a toggle to allow Control Center access from within apps. If you use Control Center a lot, you’ll want to keep this turned on. Otherwise you’ll have to press the Home button to exit each app before you can swipe up to access Control Center. On the next screen, you’ll see a list of the optional controls you can add to Control Center. To remove one from the Include list, tap the red minus button to the left of its name. To add a control from the More Controls list, tap the green plus button to the left of its name. To change the order of the buttons, tap and hold the hamburger icon to the right of each item, and then drag it into a new position. Control Center will update right away (there’s no Save button to tap or anything), so you can swipe up from the bottom of the screen to take a peek at the layout, and make further adjustments until Control Center is just the way you like it. 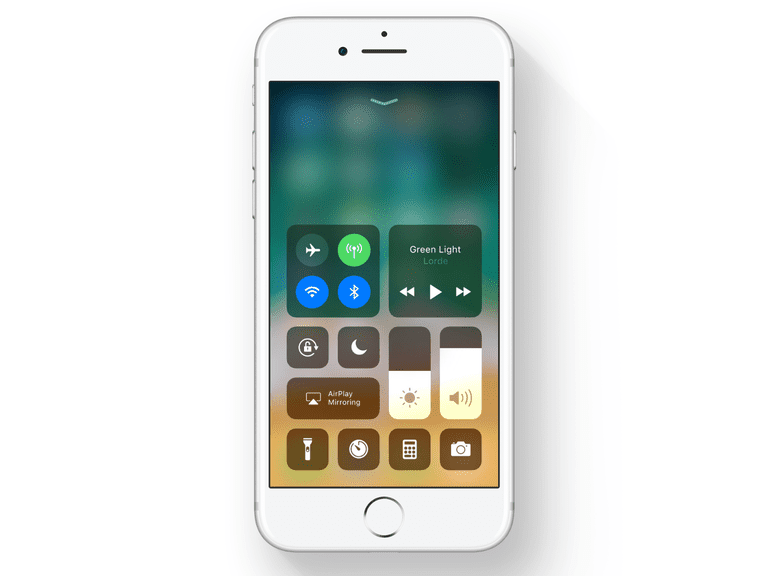 Wondering which controls and buttons are in iOS 11’s new customizable Control Center? Glad you asked. Some controls are built-in and can’t be removed, and others you’re able to add, remove, or reorder any way you like. Airplane Mode: This disables the Wi-Fi, Bluetooth, and cellular radios, which you need to do when traveling by air, although you can then turn Wi-Fi and Bluetooth back on manually. The button has an airplane on it, and it’s orange when enabled and gray when disabled. Cellular Data: This button has an antenna on it, and it’s green when enabled. Turn this off to restrict your device to connecting only by Wi-Fi—very handy when you’re nearing the end of your capped data plan. Wi-Fi: This button is blue when Wi-Fi is enabled, and gray when it’s turned off. If the Wi-Fi network is down, for example, you can turn off Wi-Fi access on your device to force it to use the cellular connection instead. Bluetooth: This button is blue when Bluetooth is enabled, and gray when it’s turned off. AirDrop (hidden): To access AirDrop, force-press or long-press the square with the Airplane mode, Cellular Data, Wi-Fi, and Bluetooth buttons, it expands to a larger menu with two additional buttons. One toggles AirDrop on and off. When AirDrop is on, it’s easy to send and receive files from nearby iOS devices over the air. Personal Hotspot (hidden): The other hidden button revealed when you long-press or force-press the Wi-Fi module is Personal Hotspot, which creates a Wi-Fi network that piggybacks on your device’s cellular connection. For example, you could create a personal hotspot with your iPhone, then connect to the resulting Wi-Fi network with your Mac. Music Module: If an app on your device is playing audio or video, you’ll find controls for it in a music module in Control Center. The mini-module you see first has buttons for Play/Pause, Back, and Forward, along with the name of what’s playing. When you force-press or long-press that module, it expands to offer more controls. You can also send that audio to an Apple TV or AirPlay speakers with the AirPlay controls, scrub through the playback, adjust the volume, and tap the name of the content to launch the corresponding audio or video app. Rotation Lock: If you’ve ever tried to read while lying down and been frustrated when apps like Kindle or Tweetbot keep switching to landscape mode, pop open Control Center and tap the rotation lock button. It has a lock and an arrow that turn red when the feature is enabled. Do Not Disturb: Tap this button to put your device in Do Not Disturb mode, which prevents notifications from lighting up your screen or making a sound while you’re trying to sleep or just take a break. To further tweak Do Not Disturb’s behavior (for example, you can allow calls from your favorite contacts to still come through), visit Settings > Do Not Disturb. Screen Mirroring: Tap this button to choose an Apple TV on the local network to mirror your screen to via AirPlay. This control can be a little confusing, since it’s for AirPlay screen-mirroring only and not for sending audio to AirPlay or Bluetooth speakers—those controls are in the expanded music module, explained above. Brightness: The brightness control is a vertical slider. You can swipe your finger up to increase the brightness, or down to decrease it. If it’s too small to comfortably adjust, force-touch the slider to expand it to a full-screen view that’s easier to manipulate. Volume: Your device’s main volume control is found here, as the same kind of slider used for brightness. Of course, every iOS device has hardware volume buttons on the side, so you might not use the volume slider in Control Center so much. Screen recording: This is a brand-new feature in iOS 11. Tap the Record button and it turns red and counts down from three, giving you just enough time to close Control Center. Then everything you do on your device is recorded as a video file. To stop, either open Control Center and tap the button again, or go back to the Home screen, tap the red “Screen Recording in Progress” banner along the top, and tap Stop from the pop-up menu. The video file is saved to your Camera Roll, where you can trim it, share it, or even send it to iMovie for more edits. It’s a nice way to record a little tutorial to show a friend how to do something in iOS, or just record a play session in your favorite game. Do Not Disturb While Driving: This feature is also new in iOS 11. The idea is, you enable this feature so your iPhone knows you’re driving, and it won’t show your calls, texts, or other notifications until you arrive and disable the mode. That way you won’t be tempted to act on these notifications on the road, since distracted driving can be so dangerous. (Visit Settings > Do Not Disturb for more options, like enabling Do Not Disturb While Driving automatically when you connect to your car’s stereo, or how your phone should auto-reply to texts to let you contacts know you can’t reply from behind the wheel. Apple TV Remote: The fourth-gen Apple TV has its own app that mimics the Siri Remote’s functions, and you can add a corresponding button to Control Center. Then just hard-press that button (or long-press it on a device without 3D Touch) to expand it to a full set of Apple TV controls: Play/Pause, Menu, TV (which launches the TV app or returns to your home screen), and even the Siri Remote’s trackpad and Siri microphone button. Flashlight: Everyone who’s dropped something in a movie theater or nightclub knows how handy this is. Tap this to light up the device’s rear camera flash, which stays lit until you tap the same button again. Timer: You can ask Siri to set timers for you, open the Clock app yourself, or just tap this button in Control Center to open the clock app right to the Timer tab. Alarm: Ditto with the Clock app’s Alarm tab—you can add a shortcut button to Control Center if you’re too shy to ask Siri to set your alarms. Stopwatch: The Stopwatch tab of the Clock app can have a button in Control Center too. Camera: Tap the Camera button to, you guessed it, launch the Camera app. This button has extra functions if you long-press or force-press it, too: shortcuts to Take Selfie, Record Video, Record Slo-Mo, and Take Photo. Home: If you have HomeKit devices, add the Home button to your Control Center, then tap it to see all the HomeKit devices you've added to iOS's Home app. Tap each device’s button to interact with it, or tap Scenes to enable any scenes you’ve set up to control multiple devices at once. Low Power Mode: This is for iPhone only, but it can really save you battery life. Your iPhone will automatically offer to go into Low Power Mode when you reach 20 percent battery life, and again at 10 percent. (When you recharge your iPhone past 80 percent, Low Power Mode automatically shuts off.) But if you add the Low Power Mode button to Control Center, you can quickly toggle it on and off anytime. Maybe turn Low Power Mode on at 30 percent to be sure your iPhone will last throughout a long commute. Or maybe turn it off if you’re at 5 percent but you’ve already plugged in, so your iPhone doesn’t go to sleep so quickly. Calculator: Go ahead and stash the Calculator app deep in a folder, because this button in Control Center lets you launch it from anywhere with just a tap. Accessibility Shortcuts: Accessibility features like VoiceOver, Smart Invert, and Color Filters are designed to make iOS devices more easily usable by people with disabilities like low vision. The Accessibility Shortcuts button puts these into Control Center, but you can also visit Settings > Accessibility for a lot more options, and even customize your own Accessibility Shortcuts menu that appears when you triple-click the Home button. Guided Access: Guided Access mode can disable touch input to parts of the screen, the device’s hardware buttons, and more. For example, if you’re a teacher giving your students a quiz on the iPad, you can disable the Home button so they can’t quit the quiz app and look up the answers in Safari. You can tweak Guided Access’s behavior in Settings > Accessibility > Guided Access, and then toggle the mode on and off by triple-clicking the Home button or tapping the Guided Access button in Control Center. Magnifier: Another Accessibility feature, using the Magnifier lets you zoom in on just a portion of the screen. If a website’s type is just too small, the Magnifier can help. Notes: Add this button if you want a quick shortcut to the Notes app. Hard-press it for shortcuts to a New Note, New Checklist, New Photo, or New Sketch. Voice Memos: And add this button if you want a quick shortcut to the Voice Memos app! Want to know the quickest way turn on AirDrop on your iPhone? Lost the Apple TV Remote? iPhone to the Rescue! How Do I Get My iPhone Screen to Rotate?